Whispers in the Loggia: Midnight at 452? Well, gang, as no shortage of you are already aware, the Big Apple is burning. And for once, these pages haven't had a thing to do with it. Datelined Rome, a Friday report on the conservative news-site Newsmax.com indicated that, earlier in the day, Pope Benedict had made his decision on a new archbishop of New York, that an announcement was imminent, and implied along the way that the most-touted contender for the mega-post -- Archbishop Timothy Dolan of Milwaukee -- was likely to get the nod. Written by Edward Pentin -- Vatican correspondent for the National Catholic Register -- the piece barely hit the wire before making the rounds at a furious clip. And ever since, the house inbox has been deluged with requests for comment, none of which have been honored, for the simple reason that, the way things have become 'round these parts, I won't say, nor run, what I can't confirm with my life and batting average intact. Suffice it to say, it's a policy born of experience. Priceless, humbling experience. Behind the page, though, what that's meant is a lot more time and energy spent nailing things down beyond any shadow of a doubt, a lot less time to answer e.mails and send acknowledgments, and more than just sometimes, 10, 12, even 15 hours or more of working the lines, all to come up with nothing but a false alarm -- for the record, this has already happened on multiple occasions... in recent weeks. But even so, just as you've come to expect "the goods," making sure what seems true actually is before a single word runs here is simply doing my job. If that looks easy, good -- just know it's anything but. While we're at it, one important corollary to all this: in a human church made up of news-loving folks, leaks happen -- sure, Americans mightn't be so used to it, but the Roman way does tend to see this as part of life (no process is perfect, and God knows the one we've got is better than, say, elections). And just as I've either been sealed or embargoed with some things over time, and in each instance have honored that trust fully and faithfully, the rest is fair game... it even has a name -- journalism. Yet in terms of an ecclesial outlook, this infinite, intense interest in what's doing behind the curtain offers a powerful storyline in itself, one that should come as both comfort and challenge to our main players: namely, leadership matters -- and God's people are, even now, looking for it. Sure, that has its downside -- and, no question, it is a cross. But in an age of protests, prophecies of doom, claims of irrelevance and warnings of decline, seeing and knowing this is the most hopeful news of all, regardless of what happens at 6 on any given morning. To the best of my ability, I've always related not what I've thought, but what I've known. And sometimes, the only honest answer I can give is that I don't know -- or, to be more precise, that these pages' usual (read: perfectionist) standard of veracity hasn't yet been comfortably reached. Along these lines, as of this writing, the substance of Pentin's report stands beyond confirmation from this end -- for now, the only lockable word says, simply, "Soon." If it pans out as he's said, the Brit rightly deserves the Kudos of the Century for scoring the Biggest Call of 'Em All... and if it doesn't, don't anyone give 'im too much grief -- in this line of work, every story is a risk we take... and, more to the point, it's nothing this scribe hasn't done before, and learned much from for the journey ahead. In recent days, the talk has reached a rolling boil. Catholics in Rome and the United States who track movements in the hierarchy say the Vatican is close to announcing who will claim what may be the most high-profile bishop’s seat in the American church. Cardinal Egan has rarely used that bully pulpit, focusing more on closing a huge budget deficit and, in the process, closing parishes and schools. His successor is expected to be far more eager to engage the public and the news media. Several names have surfaced repeatedly, but the candidate mentioned most frequently by Catholic insiders in Rome and New York is Archbishop Timothy M. Dolan of Milwaukee. Born and raised in Missouri, he has no personal ties to New York. But those who know him say he is like many bishops who have led the archdiocese in the past — an affable, outgoing, brainy Irish-American. He is not the only bishop considered a front-runner, and even the best-informed church experts say nothing is certain until the Vatican makes its announcement. Other bishops frequently mentioned as under consideration include Archbishop Timothy P. Broglio, a Spanish-speaker who served in the Dominican Republic and now ministers to Catholics in the American military; Archbishop Wilton D. Gregory of Atlanta, an African-American who was president of the United States Conference of Catholic Bishops and its public face at the height of the church sexual-abuse scandal; Bishop John J. Myers of Newark; and Bishop William E. Lori of Bridgeport, Conn. Despite the active speculation, officials at the archdiocesan offices in New York said they had no knowledge of an imminent transition. If Archbishop Dolan succeeds Cardinal Egan, he would continue a chain of Irish-Americans in the post that has been interrupted only once, in the 19th century, by a native Parisian who had fled the French Revolution. Archbishop Dolan, who turns 59 on Friday, would also be the first in the archdiocese’s 200-year history to replace a living predecessor. Recent rumors about Cardinal Egan’s imminent departure have focused on the one household possession he is known to treasure: a baby grand piano. A classically trained pianist who plays every day, the cardinal brought the piano with him from Bridgeport, where he was bishop, and is certain to take it with him to his next residence. 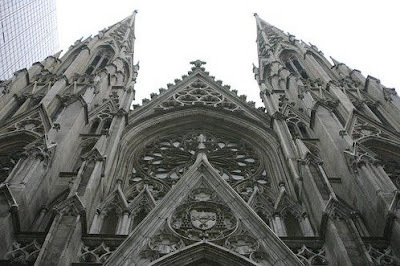 In recent weeks, several priests and other officials who had been to the cardinal’s residence on Madison Avenue reported that the piano was gone. On Wednesday, Joseph Zwilling, the cardinal’s spokesman, said there was no truth to the rumor. “The piano is in the cardinal’s residence, where it has always been,” he said.